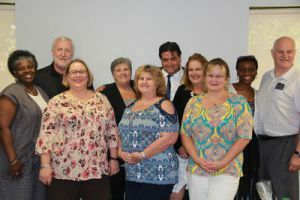 Robert Flores, 2018 president of the Association of Florida Colleges, along with AFC Executive Director Michael Brawer visited Pensacola State College on Wednesday, Sept. 6. The two executives sat in during the Pensacola AFC Chapter’s General Membership Meeting. They also spoke to members about the 2018 Legislative Outlook and other issues facing higher education in Florida. Flores and Brawer are pictured with some members of the college’s AFC chapter executive committee.